What do I do If I become a trustee? How to manage a trust? The ability to navigate through complex tax and trust documents. A high level of commitment to practice impartiality in the sensitive dynamics that often play out between family members relative to money. A trustee is required to always act in the best interest of the beneficiaries without fear or unfair favor to one above another. Aptitude or proficiency for decision making and asset management. A strong sense of loyalty to beneficiaries and what may be, a long term commitment. What to do if I become a trustee? This is an important question that highlight the unique position of a trustee. Recognize that accepting the responsibilities of a trustee may constitute a significant commitment in time; especially if there are multiple beneficiaries and the specialized knowledge to carry out the tasks of a trustee are initially lacking. 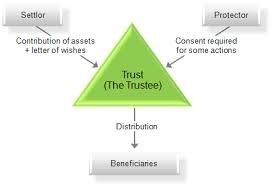 The definition of a trustee as demonstrated in the chart below, is one that holds property interest on behalf of another (Settlor) for a third party or parties (Beneficiary) usually under the direction of an overseer (Protector) of the trust to act in accordance with the terms and conditions of same or a Will contained within the trust documents. Possess or be willing to acquire the necessary acumen to direct the assets of the trust through productive decision making for acquisitions, investments relevant to account and property management. Possess a higher than average level of equanimity in order to be able to calmly defray potential disputes between beneficiaries. Keep personal assets such as property, income and accrued or accruing interest separate from their own. This will protect the trustee from any liability that may occur from losses in trust assets. Be capable and prepared to defend challenges pertaining to the validity of the trust documents. Preserve and or grow trust assets through prudent investment activities such as acquisitions and/or sales. There are also caveats to being a trustee such as never profiting from transactions directly related to the trust and its beneficiaries and the possibility of incurring personal expenses that may not be reimbursed by the trust to name a few. The following estate flow-chart designed by Legal Teach design provides an easy to understand outline of the duties and problems of being a trustee. Beyond dealing with the complexities of trust documents and the importance of handling a range of relationship issues and concerns of beneficiaries, the trustee must be prepared to set aside whenever necessary, their own issues to deal with the demands of a trust. As such, individuals considering making a friend or family member a trustee must also be cognizant of the person’s capabilities or lack of them, the existing demands on their life as a whole as well as how this responsibility will ultimately impact that individual’s life. Fast and accurate execution of accounting, reporting and other administrative duties. Corporate held trusts are regulated and monitored by specific government agencies. Family disputes and problems relevant to the trust are handled in a neutral and therefore fair process. Accountability ensures greater qualitative decision making in asset management and handling personal or legal disputes that a family member or friend may be incapable of dispelling alone. Capability of providing long term service for the duration and shifting demands of the trust. Choosing or agreeing to become a trustee should be carefully considered against the demands, qualifications and potential legal ramifications of this position. As such, the appointment of a trustee or acceptance of this responsibility represents a business rather than a personal decision. It is therefore highly recommended that prior to selecting a trustee, exploration of the individual’s willingness or ability to commit to administration of a trust as well as the potential benefits of a corporate trustee should be properly explored. Also keep in mind that the full burden of fiduciary responsibilities may be shared through a “hybrid” arrangement that enlist the assistance of a corporate trustee.